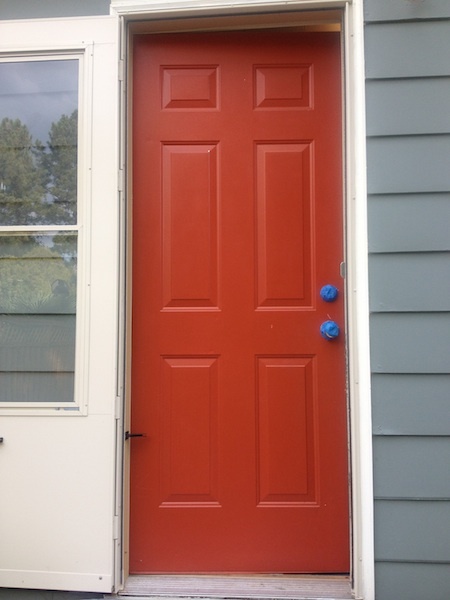 This is our back door, you can see the pretty new paint on the walls and trim (I love it so much) and then we have the orangey red door that I'm just not into. It really isn't totally awful but it's just not really me. What color did I decide on? Purple - yes purple. I don't think purple will be everyone's cup of tea but I liked the idea and went with it, you can scroll down and check out the final product if you want to just skip ahead. So the only taping off I did was the actual door knob and lock. 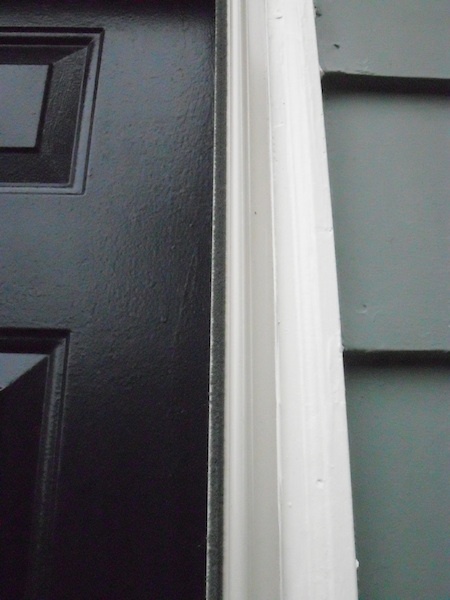 When painting the door I just kept it cracked open so I cook carefully run down the edges and not get paint on the trim. I also had a drop cloth (well an old beach towel) covering the steps so I wouldn't make a gigantic mess. I have painted almost every inch of this house, at the point I almost feel like a professional -almost. Check out that purple, I'm crazy. So next I used a brush to get all of the edges and indentions and things that a roller couldn't do. When deciding on a paint finish I just asked the paint guy at home depot what he recommended and went with that. It's a semi-gloss durable paint for exteriors by Behr. Honestly, it may be a little too glossy for my taste but I'm hoping that with it being an exterior door that some of the shine will dull a little over time, but I can live with it for now. And here's my first pass of the roller. I did not use any fancy kind of roller or small roller size. I just used a cheap regular sized one. After painting our house and trying out different ones I really could not tell a difference on the exterior. To me, the actual high quality paint was what made the biggest difference. Some people would probably disagree with me but that's just my experience. I still needed another coat, especially to fill in the spots around the edges. And here's the final product all purply and stuff. It actually dries much darker and isn't quite as bright purple as the wet paint looks above - see I'm not that crazy. I know most people wouldn't go for it but I like it. It's different and adds a little hint of color. It really almost looks black from the road, most people probably won't even be able to tell. So now hopefully I'm off to finish the other two today, if the weather allows me. The wall paint looks so different in these two pictures- this bottom photo is more accurate to the actual color. Hope everyone had a great weekend! Any of you guys get any looming projects completed this weekend? 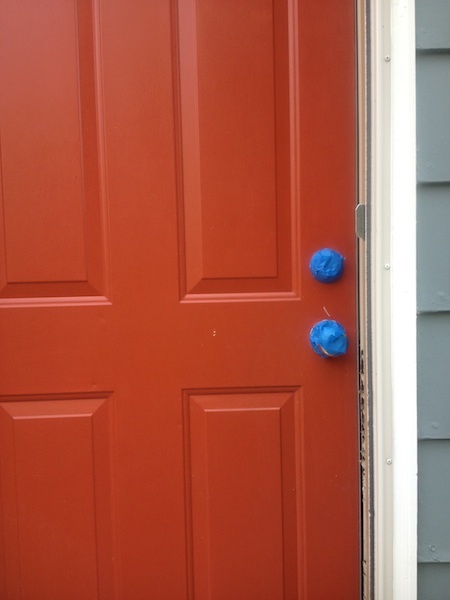 What color door does your house sport? Any other purple doors out there?? Do share! I love the purple door! Very fun and whimsical. I love the color! It looks fantastic! 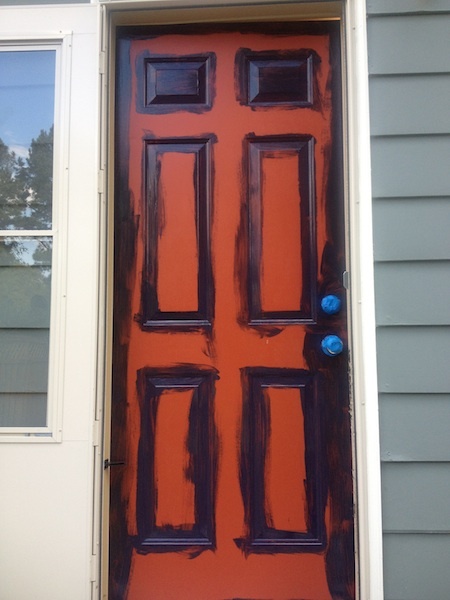 I just had to come and visit and see how you painted your door! Funny thing is I just did the same balck colour and my door was the same colour previously too!! Weird! You did a fabulous job on your door. Mine was a week long project since the weather is so unpredictable. I love the outcome, your door looks rich and beautiful now! 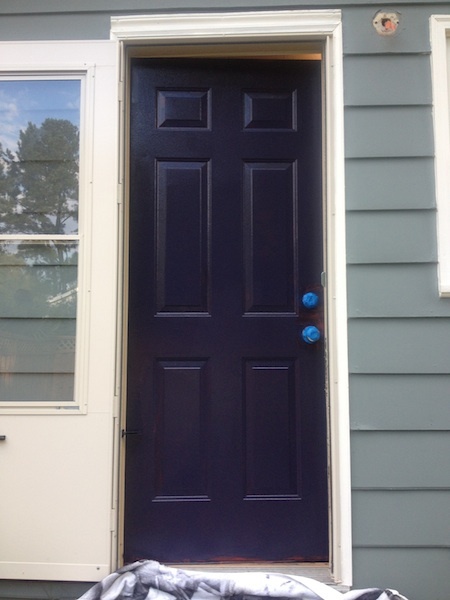 I too am painting a purple front door. What season....Fall? yay! I'm loving our purple door! I LOVE the door, I personally don't think it even really looks purple but that could just be the picture. It almost looks black, it looks great though regardless. I've been trying to determine painting my door.. but I'm unsure of the black with our tan siding and stone. I might just go for it! I know it's been a while since you did this,but do you happen to remember what color you used? 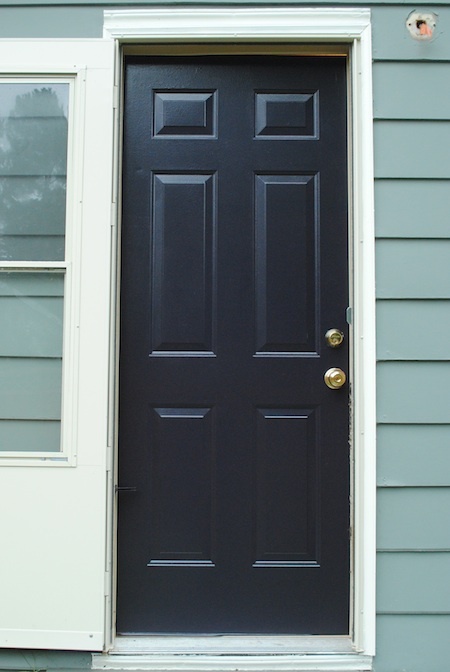 I want to paint my front door a really dark purple (almost black) color and yours looks perfect!